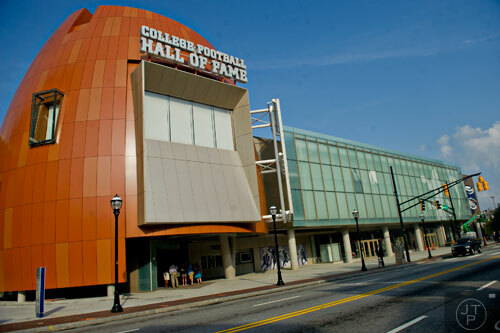 We are Decking the Hall this holiday season at the College Football Hall of Fame and Chick-fil-A Fan Experience. Come be merry and bright with us beginning December 10th and running through New Year’s Day. Daily activities include unique photo opportunities, ornament crafts and special appearances by Fumbles the Elf. If you are still in need of the perfect family photo for the holidays, Santa will be visiting the Hall on Saturdays and Sundays from 10-2. We will have plenty of college themed props for your very own team photo. While you’re here, be sure to stop by our Giving Tree. We are collecting blankets and twin sheet sets for City of Refuge. Bring them with you when you come and get 20% off Hall admission. All the festivities are included in regular admission, so grab your friends, family and coworkers and come Deck the Hall.